Given the late war German penchant for adding weapons to anything that moved and had armor protection, desperation is the mother of invention. The best overall antitank gun the Germans had was the 7.5 cm Pak 40 and late in 1944 it began to show up on anything the Germans could mount it on. While effective in its towed form, as the Allies brought in more artillery towed weapons began to suffer greater attrition and also the problem of mobility. This weapon, which married the Pak 40 to their D model of the medium armored personnel carrier version of the halftrack, was a quick and expedient way to accomplish those ends. 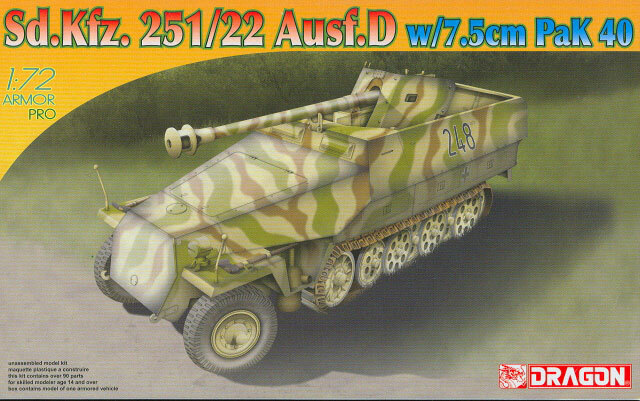 DML has now taken their recently added 1/72 7.5 cm PaK 40, dropped the lower carrigae, added four parts, and created the “Stroke 22" to its popular line of 1/72 scale German halftrack kits. The PaK 40 is a jewel that consists of some 34 parts, and as previously noted looks to be a nicely done pantograph of their developed 1/35 scale PaK 40 family. It comes with three different barrel options (slide molded with hollow bores) but this version comes with the heavy bracing and platform mount to install it into the 251 hull. An etched brass insert (MA5) is provided for the gun shield sliding mask which goes above the gun barrel when the shield is installed. The directions also indicate shaving the inside edges of the gun shield (H28 and H29) to achieve the proper thinness and standoff of the original. However this kit follows most of the recent DML kit in that etched brass is becoming no longer an option. The base shield and roof element for the cab section (MA2) must be folded and inserted into place when the gun mount is installed. Also the stowage bin (MA3) has to be added as well. Last of all is MA1, the hood. The other parts in brass include the gun travel lock (MA 5- 6) and some small bits for the hood. The rest of the kit follows the tried and true DML halftrack system. The lower hull is a single piece pan, less the rear area, and the axles are molded on the lower hull. The running gear for each side consists of a rear (inside) wheel section, a center wheel section, three outer road wheels, and drivers. Once installed the connectors between the individual wheels on the inside and the center are not visible, so it helps speed up assembly while making it easier to get things aligned. Tracks are the gluable DS plastic, so you can also get them to settle down on top of the road wheels with some care. The model comes with simplified but plentiful interior fittings but they are quite tiny as noted and will require a good deal of care. Interior bits include the various control levers, rifles, MP submachine guns, and other items. The hinge mechanisms for the doors are single pieces, but are non-operating types. They cement to the lower rear section, as the upper hull has the rear angular parts of the hull attached to it. The four front viewers are separate parts and can be cemented either open or closed as well, as is the hood assembly with two flaps. No engine or interior is provided for the engine bay. The fenders are two-piece units, but the stowage bins are only offered as closed parts. Other RP parts include the “Notek” headlight and mount and the drum magazines for the MG 42 machine gun. The weapons appear to be very close to scale, something I don’t recall from other manufacturers in the past! Two finishing options are provided: neither one identifies a unit but one is for a vehicle with three-color camo (black 248) and the other in sand with white crosses. A small set of generic license plates from Cartograf is provided along with the targeted sheet. Overall this kit adds a popular version to the lineup and should be well received.